WhAT KEY ISSUE PREVENTS COUNTLESS INVESTORS FROM PARTICIPATING IN MULTIPLE-YEAR BULLISH MOVES IN THE STOCK MARKET? Volatility makes it difficult to navigate between point A and point B. The answer to the question above is volatility. The real big money is made in the stock market by participating in long-term trends. In the chart to the right, the day-to-day and sometimes gut-wrenching volatility between point A and point B makes it difficult for investors to stay invested. The same chart with price removed.. The 200-day moving average has been added to help filter out the noise. The CCM Market Model helps us discern between volatility to ignore within the context of an ongoing and established bullish trend, and volatility to respect that requires some form of defensive action. For example, if we remove volatile price between the same A to B points and replace it with the simple 200-day moving average, we can see the long-term trend remained in place. We can objectively measure and track the S&P 500's 200-day moving average, allowing us to make logical and rational decisions, rather than emotionally-charged and irrational decisions. The observable evidence started to shift in 2000. The slope of a 200-day moving average is just one example of literally hundreds of binary questions asked by the model. Using a wide range of thoroughly researched and backtested inputs allows us to allocate our hard-earned capital based on the weight of the evidence, rather than fear. Eventually, trends roll over and "volatility to ignore" morphs into "volatility to respect". 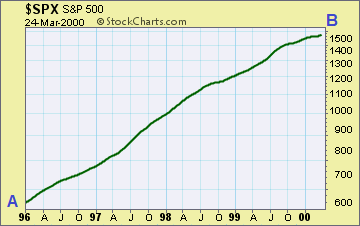 The S&P 500 peaked in late March 2000, but held up relatively well until September 2000. As shown in the 3rd chart in the right margin, the S&P 500's 200-day moving average clearly rolled over, flipping a binary and bullish "yes" to a binary and bearish "no". The observable evidence was helpful since the S&P 500 continued to fall into October 2002 and did not find its "new bull market" footing until spring 2003. In the dot-com bear market example, the S&P 500's slope rolled over in a bearish manner in November 2000 with the S&P 500 trading at 1,430. 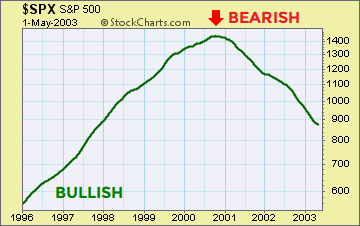 Unfortunately for passive, low-cost, buy-and-hold investors, the bear market bottom did not arrive until October 2002 when the S&P closed at 776. After the 200-day rolled over, after we could see it, measure it, and put it in a model, the S&P 500 lost an additional 46%.